Stars: Duane Jones, Judith O'Dea, Russell Streiner, Karl Hardman, Keith Wayne, Marilyn Eastman, Judith Ridley, Kyra Schon and Charles. Contains strong injury detail, threat, violence. 50th Anniversary - Re-mastered in 4k MOMA version! 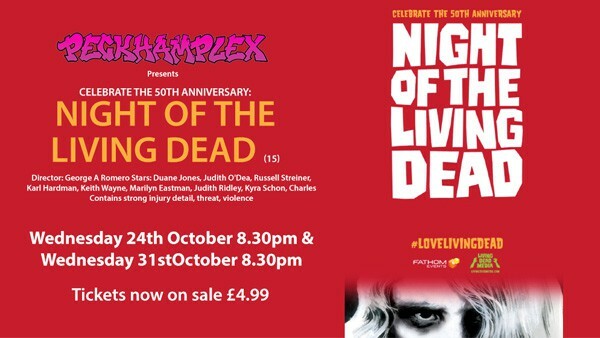 Celebrate 50 years of Living Dead by seeing the completely restored and re-mastered version of Night of the Living Dead at Peckhamplex. The iconic film that started the zombie genre and shaped modern horror movies. Directed by George A Romero, the film is a great story of independent cinema. Custom featurette of 12mins to be shown before the screening – full of great new and archival footage from 1968 and interviews with George A Romero’s son, along with other filmmakers talent (i.e. Producer Russell W Streiner, Actress Judith O’Dea, Writer John Russo).